2. Deep conditioning before shampooing. 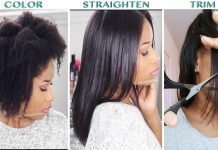 I discuss a few mistakes but there are others that we do in the natural hair community. We can get it in due time. Conditioners help your hair mostly through adsorbing into its outer cuticle. Adsorption refers to ingredients attaching to the surface of the hair. However some deep conditioners have ingredients with a low molecular weight and are designed to absorb beneath the cuticle layer also. To successfully adsorb the elements onto or within the hair requires the attraction of a positive and a negative charge. Conditioners contain cationic surfactants within them that carry this positive charge while after cleansing the hair itself holds a negative charge. This attraction between the two allows for adsorption to occur. 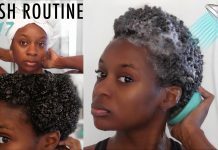 If we can understand deep conditioning natural hair and have a good routine for it, hair will thrive (if there is not medical reason it wont). Check it out and tell me what you think in the comment box. Enjoy and remember to support by Subscribing to this channel and liking this video. Muah!!! Email Nappyfu@gmail.com for any questions, suggestions, concerns, help or just to say “Hey” !!! DISCLAIMER: I am NOT a trained/practicing stylist, cosmetologist, beautician, dietitian or medical professional. All suggestions, tips, prizes, techniques and advice given are for informational purposes only and should be used at your discretion and best judgment. I highly recommend conducting strand tests when trying or using new products, hair appliances and product mixes. I am not responsible or liable for adverse or undesirable affects including hair loss, hair breakage or other hair/scalp/skin/body damage as a direct or indirect result of the suggestions, tips, prizes, techniques and/or advice given. 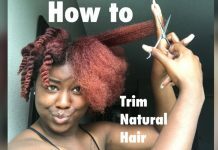 (How-To) Color, Straighten + Trim NATURAL HAIR!